Climate Common Sense: New Chief Scientist can read English! ''There are probably people now who think I am partisan because I'm saying the science is in on climate change. Well, I don't think that's partisan, I think that I can read English,'' he said. Of course Chubb's neuroscience qualifications and English literacy give him a special qualification to disagree with the following who maybe can't read as well as some of the Warmist camp-followers! Richard Siegmund Lindzen (born February 8, 1940, Webster, Massachusetts) is an Americanatmospheric physicist and Alfred P. SloanProfessor of Meteorology at the Massachusetts Institute of Technology. Lindzen is known for his work in the dynamics of the middle atmosphere,atmospheric tides and ozone photochemistry. He has published more than 200 scientific papers and books. He was a lead author of Chapter 7, 'Physical Climate Processes and Feedbacks,' of the IPCC Third Assessment Report on climate change. He is a well known skeptic of global warming and critic of what he states are political pressures on climate scientists to conform to what he has calledclimate alarmism. Freeman John Dyson FRS (born December 15, 1923) is a British-born Americantheoretical physicist and mathematician, famous for his work in quantum field theory,solid-state physics, astronomy and nuclear engineering. Dyson is a member of the Board of Sponsors of the Bulletin of the Atomic Scientists. Dyson has lived in Princeton, New Jersey, for over fifty years. One of the greatest living phycisists sometimes called the "heir to Einstein" Dyson has worked in the climate physics field and his skepticism is a huge embarassment to scientific pretenders promoting the Climate Hoax.
. “His mind is still so open and flexible,” Sacks says. Which makes Dyson something far more formidable than just the latest peevish right-wing climate-change denier. Dyson is a scientist whose intelligence is revered by other scientists — William Press, former deputy director of the Los Alamos National Laboratory and now a professor of computer science at the University of Texas, calls him “infinitely smart.” Dyson — a mathematics prodigy who came to this country at 23 and right away contributed seminal work to physics by unifying quantum and electrodynamic theory — not only did path-breaking science of his own; he also witnessed the development of modern physics, thinking alongside most of the luminous figures of the age, including Einstein, Richard Feynman,Niels Bohr, Enrico Fermi, Hans Bethe, Edward Teller, J. Robert Oppenheimer and Edward Witten, the “high priest of string theory” whose office at the institute is just across the hall from Dyson’s. Yet instead of hewing to that fundamental field, Dyson chose to pursue broader and more unusual pursuits than most physicists — and has lived a more original life. Dyson recently entered into an email interview with a too-smart journalist from the Independent. You are one of the most famous living scientists, credited as a visionary who has reshaped scientific thinking. Some have called you the "heir to Einstein", yet you are also a "climate sceptic" who questions the consensus on global warming and its link with carbon dioxide emissions. Could we start by finding where we agree? I take it you accept for instance that carbon dioxide is a powerful greenhouse gas that warms the planet (1); that atmospheric concentrations of CO2 have risen since direct measurements began several decades ago (2); and that CO2 is almost certainly higher now than for at least the past 800,000 years (3), if you take longer records into account, such as ice-core data. Answers to your questions are: yes (1), yes (2), yes (3), maybe (4), no (5), no (6), no (7). There are six good reasons for saying no to the last three assertions. First, the computer models are very good at solving the equations of fluid dynamics but very bad at describing the real world. The real world is full of things like clouds and vegetation and soil and dust which the models describe very poorly. Second, we do not know whether the recent changes in climate are on balance doing more harm than good. The strongest warming is in cold places like Greenland. More people die from cold in winter than die from heat in summer. Third, there are many other causes of climate change besides human activities, as we know from studying the past. Fourth, the carbon dioxide in the atmosphere is strongly coupled with other carbon reservoirs in the biosphere, vegetation and top-soil, which are as large or larger. It is misleading to consider only the atmosphere and ocean, as the climate models do, and ignore the other reservoirs. Fifth, the biological effects of CO2 in the atmosphere are beneficial, both to food crops and to natural vegetation. The biological effects are better known and probably more important than the climatic effects. Sixth, summing up the other five reasons, the climate of the earth is an immensely complicated system and nobody is close to understanding it. That will do for the first set of questions. Now it is your turn. So you accept that carbon dioxide is a powerful greenhouse gas that warms the planet, that concentrations of CO2 in the atmosphere have been rising since direct measurements began several decades ago, and that CO2 is almost certainly higher now than for at least the past 800,000 years. You think it "maybe" right that CO2 levels have been increasing as a result of fossil fuel burning but you don't accept that global temperatures have been rising nor that the increase in carbon dioxide has anything to do with that supposed trend. And finally, you have little or no faith in the computer models of the climate. 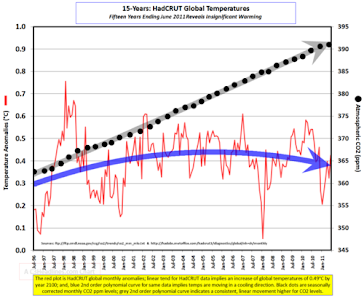 As a physicist you must be aware of the calculations of estimated increases in global average temperatures due to the positive radiative forcing of the extra carbon dioxide in the atmosphere – the heat "captured" by CO2. The mainstream estimate suggests that doubling CO2 from pre-industrial levels would increase global average temperatures by about 3C. If you accept that CO2 levels have never been higher, but not that global average temperatures have increased, where has the extra trapped heat gone to? Can we deal with this before we go on? No thank-you! The whole point of this discussion is that I am interested in a far wider range of questions, while you are trying to keep us talking about narrow technical questions that I consider unimportant. You ask me where the extra trapped heat has gone, but I do not agree with the models that say the extra trapped heat exists. I cannot answer your question because I disagree with your assumptions. Sorry you feel that way, I hope we can get back on track. I was only trying to find out where your problem lies with respect to the scientific consensus on global warming. As you know these models are used by large, prestigious science organisations such as Nasa, NOAA and the Met Office, which use them to make pretty accurate predictions about the weather every day. The scientists who handle these models point out that they can accurately match up the computer predictions to real climatic trends in the past, and that it is only when they add CO2 influences to the models that they can explain recent global warming. There is a scientific consensus that CO2 emissions are having a discernible influence on the global climate and I was attempting to find out more precisely why you part company from this consensus. You have written eloquently about the need for heretics in science who question the accepted dogma. There are a number of notable instances in science where heretics have indeed been proven to be right (Alfred Wegener and continental drift) but many more, less notable examples where they have been shown to be wrong and, in time, will be forgotten (remember Peter Duesberg or Andrew Wakefield?). So it was in the light of your heretical stance on climate science that I'd like to know why we should believe a few lone heretics – albeit eminent ones such as yourself – rather than the vast body of scientists who have a plethora of published work to back up their claims? It's an important question because it's about who we, the public, should believe on scientific matters and why? When I was in high-school in England in the 1930s, we learned that continents had been drifting according to the evidence collected by Wegener. It was a great mystery to understand how this happened, but not much doubt that it happened. So it came as a surprise to me later to learn that there had been a consensus against Wegener. If there was a consensus, it was among a small group of experts rather than among the broader public. I think that the situation today with global warming is similar. Among my friends, I do not find much of a consensus. Most of us are sceptical and do not pretend to be experts. 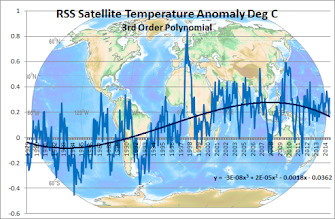 My impression is that the experts are deluded because they have been studying the details of climate models for 30 years and they come to believe the models are real. After 30 years they lose the ability to think outside the models. And it is normal for experts in a narrow area to think alike and develop a settled dogma. The dogma is sometimes right and sometimes wrong. In astronomy this happens all the time, and it is great fun to see new observations that prove the old dogmas wrong. I am glad we are now talking about more general issues and not about technical details. I do not pretend to be an expert about the details. Well, I'll try to keep it general, but it may involve talking specifics. One of my own academic mentors once explained to me that science is really just a very useful intellectual tool for teaching us about the world, just as philosophy teaches us how to think. The trouble for non-scientists is that we have to rely on professional scientists to tell us what they are finding out. But as you say yourself, it is even difficult sometimes for scientists in one field of endeavour to truly get to grips with the details in a different discipline. So, as a layman, I look at the wealth of evidence being presented to me on climate change, and the qualifications and track record of those presenting their results in the peer-reviewed literature, and I make a judgement. Do I believe in the small minority of mavericks, many of whom do not have a published track record, or the vast majority who do? Do I go with the heterodox or the orthodox? Politicians of course have to do the same but they have to make important decisions, or not as the case may be. And the problem with climate change, as you know, is that if we wait until we are absolutely certain beyond any doubt whatsover that global temperatures are rising dangerously as a result of carbon dioxide emissions, it will be too late to do anything about it because of the in-built inertia of the climate system. Even if we stopped carbon dioxide emissions overnight immediately, temperatures would still be expected to increase for some years to come before they stabilise. So I guess my question would be, what if you are wrong? What if all the other scientists connected with the Intergovernmental Panel on Climate Change, the UK Met Office, NASA, NOAA, the World Meteorological Organisation, and just about every reputable university and institute doing research on climate science, happen to be right? Isn't it a bit risky for me and the rest of the general public to dismiss this vast canon of climate science as just "fuss" about global warming when all I've got to go on is a minority opinion? I have this unfortunate habit of answering email immediately, which is in the long run not sustainable. So I will answer this one and then remain silent for three days. Just to return to Alfred Wegener for one moment. Although he wasn't the first to note that the continents seem to slot together like a jigsaw, such as the west coast of Africa and the east coast of South America, he was a visionary who actually went out to find the geological evidence to support his idea of continental drift. However, as you say, he didn't have a mechanism for how this "drift" happened. So it is perhaps understandable that many of his peers dismissed his theory in the 1930s. It was only with the discovery of plate tectonics 30 years later that everyone could agree on the true mechanism, which replaced Wegener's discredited theory of the continents somehow forging their way through the crust of the ocean basins. This doesn't in any way undermine his heroic contribution to science, and I say heroic in the true sense of the word given that he died in 1930 on his 50th birthday while trekking across Greenland – his body was never recovered and is now presumably encased in ice and moving slowly to the sea. The point I want to make is that it may well have been right for the scientific "establishment" of the 1930s to be sceptical of Wegener's theory until more convincing evidence emerged, which it eventually did. The experts, rather than the public, could see the flaws in Wegener's argument which is why there was a scientific consensus against him. You are saying that the situation today with global warming is similar. However, surely an important difference this time is that it is the scientific consensus that is warning us of the dangers of continuing emissions of carbon dioxide, and that this consensus is saying quite categorically that if we wait until utterly definitive evidence emerges of dangerous climate change it will be too late to do anything about it. One of the problems I have with the climate "sceptics" is that they keep changing their arguments. First they say that there is no such thing as global warming, thereby dismissing all the many thousands of records of land and sea temperatures over the past century or so. Then they say that carbon dioxide emissions are not causing the Earth to warm up, thereby defying basic physics. If that fails, they say that a bit of extra heat or carbon dioxide might not be that bad – it may be true that more people die from cold than heat, but how many die of drought and famine? And true, carbon dioxide boosts plant growth, but did you see the recent research suggesting a possible link between two atypical droughts in the Amazon in 2005 and 2010, when the rainforest became a net emitter of carbon dioxide, with higher sea-surface temperatures in the tropical Atlantic? Plants need water, not just carbon dioxide. And if all else seems to fail, the final line of argument of the "climate sceptics" is that, "OK, carbon dioxide may have something to do with rising temperatures but what the heck, we can't do anything about it because the cure is worse than the disease". It seems to me that although there are still many uncertainties, much of the science of climate change is pretty settled, more so than you will admit to. To continue to report on "both sides" as you suggest is rather like ringing up the Flat Earth Society and asking them to comment on new discoveries in plate tectonics. My three days of silence are over, and I decided I have no wish to continue this discussion. Your last message just repeats the same old party line that we have many good reasons to distrust. You complain that people who are sceptical about the party line do not agree about other things. Why should we agree? The whole point of science is to encourage disagreement and keep an open mind. That is why I blame The Independent for seriously misleading your readers. You give them the party line and discourage them from disagreeing. With all due respect, I say good-bye and express the hope that you will one day join the sceptics. Scepticism is as important for a good journalist as it is for a good scientist. Sorry you feel that way. Thank you anyway. Maybe Professor Chubb would also like to email Freeman Dyson to set him straight!